Samsung UE48HU7500 review | What Hi-Fi? 4K Ultra HD TV isn’t exactly new anymore, but we’ve only awarded the full five stars to a 4K telly very recently. That TV? 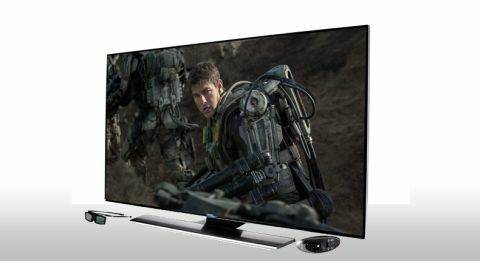 Samsung’s awesome UE65HU7500, which delivers on the dream of super-sharp 4K without sacrificing the quality of HD and SD. But what if 65in is just a bit too big for your room? Well, that’s where its 48in brother - the UE48HU7500 - comes in. Unsurprisingly, this looks like a slightly miniaturised version of the 65in model. A lovely thin bezel means the front is almost all screen, and the overall design is very smart but uncharacteristically subtle for a Samsung. It seems odd the stand doesn’t swivel, especially as others in the Samsung range do, but the footprint is small enough and the overall set is light enough to make moving it easy. As you’d expect from a premium TV, there are plenty of connections: three USB and four HDMI, plus both satellite and aerial connections for broadcast TV. Set-up is easy: THX Optimizer-led picture tweaks aside, you will be watching your new TV in less than 10 minutes. Of course, you’re immediately going to log-in to Netflix and hunt out Breaking Bad or House of Cards, two of the shows currently available for streaming in 4K. Both look superb on the UE48HU7500, with House of Cards in particular supremely sharp and detailed. Textures are tangible and the sharp images burst from the screen. A press of the ‘Smart Hub’ button brings up a row of tiles representing a mixture of channels, apps and inputs; this is where you will find the usual suspects (YouTube, Wuaki, games and on-demand content). It’s well thought out and designed, and very easy to use. The first page - ‘On TV’ - doesn’t include any content from any internet services, but for most people it’s likely to be the most useful. Here, the channel you’re currently watching shrinks to a window about a fifth of the size of the whole screen, with the rest of the space containing nine large thumbnails representing programs that are being broadcast right now or starting soon, each of which has been selected based on the kind of thing you usually watch. Thanks to these large pictures and clear progress bars, it’s extremely easy to tell - at a glance - if there’s anything up your street available to watch, making it a million times more useful than a traditional EPG. Of the five ‘panes’ of the Smart Hub, this is clearly the one that’s been most thoroughly thought out and designed. Sliding left to ‘Apps’ just gives you rows of apps that can be accessed from the set, while another left takes you to ‘Games’ - the selection of which won’t excite anyone who’s used a smartphone or tablet over the last few years. The pane furthest to the right is for ‘Multimedia’, which includes YouTube videos, radio channels and the like. This is also where you’ll find any connected computers, smartphones or USB storage devices. Next to that is ‘Films & TV Shows’, which is intended to act as a shortcut to the best on-demand content available from the telly. So the UE48HU7500 is plenty smart enough, but actually no more so than Samsung’s other 2014 smart TVs - such as the terrific, Full HD UE48H6400 (which is £900 cheaper than this set). That jump may be worth it for 4K content, but only if there aren’t any sacrifices elsewhere. And in our opinion, there aren’t. There is a very slight sense of processing going on with its Full HD image – no surprise given how much work the TV’s having to do to upscale images to fit its native 3840 x 2160 resolution – but that’s only really noticeable under serious scrutiny and side-by-side comparison. To all intents and purposes, what you’re getting is a picture that’s just as detailed and sharp as the Full HD model. In some ways it’s even better. Activate the ‘Smart LED’ mode and contrast jumps up considerably, with inky-deep blacks combining with bright, pure whites to produce a picture with more punch. The UE48HU7500 has a more neutral colour palette by default, too. In essence, then, when watching both standard definition and HD, the HU7500 is more or less a match for the best non-4K TV of this size that Samsung has so far offered this year. So you can have your 4K cake without making your existing Blu-rays or DVDs any less tasty. Everything sounds pretty good, too – clear, loud and fairly punchy by flatscreen standards. The ultimate value of 4K is, of course, up to you, the end user – but as to whether 4K resolution is even noticeable at 48in, the answer is a resounding ‘yes’. If the size is right for you, we certainly recommend taking the plunge.